Despite what the first half of its title may imply, Kingdom Hearts 3D is not Kingdom Hearts III. Sorry, long-time fans who’ve long been pining for that official console sequel. That said, with the wide variety of handheld Kingdom Hearts spin-offs to sift through – Chain of Memories, Birth by Sleep, Re:coded, 358/2 Days - this installment comes the closest to recapturing the same whimsical magic we felt playing KHII on the PS2 (one of the best games of all time). Dream Drop Distance unloads a bevy of mechanics onto the player all at once, some of which could be decidedly polarizing – but the series’ same basic principle holds true: Square Enix and Disney devotees will feel joyously sentimental during their trip through this Magic Kingdom. The “hook” of Dream Drop Distance is that it stars those lovable keyblade-wielding buddies, Sora and Riku, in equally substantial parts. Bonded at the heart by their innocent bromance, they’ve taken to exploring alternate worlds in a test to prove themselves worthy of a Mark of Mastery. 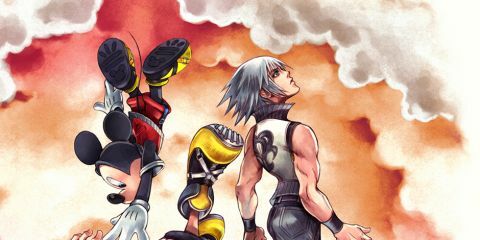 While working together across time and space, Sora and Riku will encounter two considerably distinct halves of each of the seven worlds, constantly lending their counterpart a helping parallel-dimension hand. Once again, we applaud the performances of Haley Joel Osment and David Gallagher in the leading roles (backed by the dozens-strong supporting cast) – their sincere delivery of each and every line will remind you how crucial voice acting can be to the emotional payoff of a game. Combat is mostly the same as you remember it, with a few refinements from previous games and a Pokémon-like twist. You’ll still be swinging your keyblade with abandon as you tear through enemies, casting spells and unleashing flashy special moves using your sequential, customizable Command Deck – but instead of vanquishing darkness with Goofy and Donald at your side, you’ll be collecting a menagerie of battle-ready pets as your allies. The shadowy Heartless have been benched, replaced by psychedelic Technicolor animals called Dream Eaters. Slicing them up yields materials used to craft your own loyal Dream Eaters, who’ll link up with Sora and Riku to unleash a variety of attacks. Collecting Dream Eaters has the same addictive appeal as amassing souls in the DS Castlevania games: encountering each new enemy type will have you excited to see what they’ll eventually bring to your roster. But despite their cuddly cuteness, no amount of touchscreen minigames or pet management can make the voiceless Dream Eaters match the same charming companionship that Goofy and Donald offered. At any time, you can “Drop” between the two characters and pick up where the other left off; eventually, you’ll be forced to switch over, thanks to a constantly depleting Drop Gauge that’ll last around 20 to 30 minutes (or longer, if you’ve been stocking up on Drop-Me-Not potions). It adds a novel element of strategy to your macro-level gameplay: you’ll need to plan ahead for the appropriate times to drop, lest you get ripped out of your body mid-battle. We learned the hard way that dropping during a boss fight restarts the encounter – a groan-worthy setback, but one that’s easily learned from, and unlikely to be repeated. Description Join Mickey and more Disney stars for a Kingdom Hearts adventure on Nintendo's handheld.